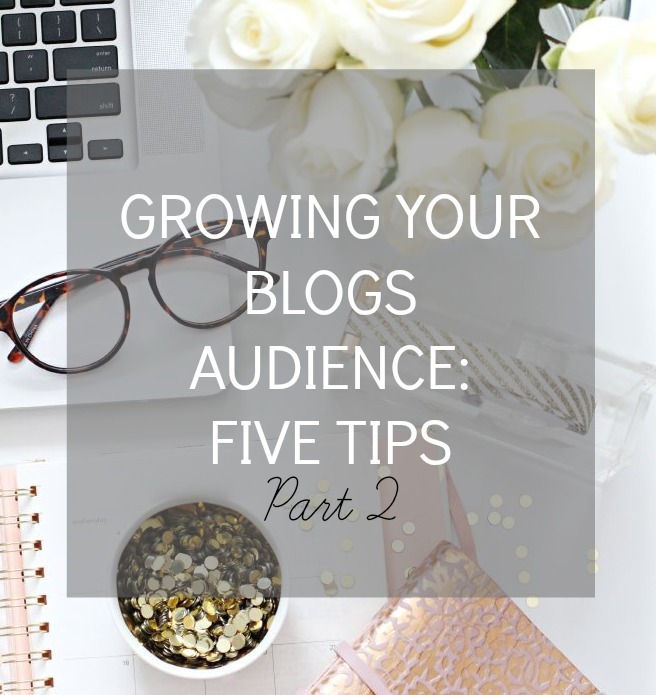 One of my most popular posts to date is 'Five tips for growing your blogs audience' which you can read here if you haven't already. As I got such a good response from that post (its my most liked post on Bloglovin, ever) and lots of you found it useful, I thought I'd do a part two offering five more tips! I want to put a little disclaimer out there and say that I'm in no way saying you must do these things, these are just a few things I've found have worked for me over the past few years and things that may be helpful to you if you're just starting out. When I first started blogging I would spend hours and hours reading blogging tips and advice posts because firstly I find hearing about things that have worked for other people really interesting and secondly because they really helped me to shape my blog into what it is today. I also want to write posts on this blog that I'd enjoy reading myself so with that being said, lets get to the good stuff..
One of the biggest 'make or break' parts of a blog would have to be the photography. For me, and lots of other people, I'm much more likely to hit the follow button if a blog has great photos to accompany their written content. I'm not saying you need to take photos that rival David Bailey but it is important that they're big, clear and bright. The world is a visual place (all you need to do is take one look at sites like Instagram & Pinterest to realise that) and people love seeing good quality images on blogs. It can take a lot of time to get that perfect shot along with editing and uploading but the benefits are so worth it. Its also a good idea to be creative with your images too - adding props in the background can really catch peoples eye and give your images more depth! When writing a blog its SO important to write something you'd personally like to read. Now you might be thinking 'how is that going to grow my audience?' but if you're writing about things you're interested in and want to write about instead of the things you think you should write about, it'll reflect in your content and be more engaging for those people who stumble upon your site for the first time. I can always tell when people have wrote about something just because they feel they have to and if there's no passion behind it, its pretty easy to tell. You should never feel like you have to write about certain topics or stick to a specific niche - just write about the things you love and your passion will shine through and keep people reading. I guess what I'm trying to say is don't follow the crowd. Just because everyone else is posting about a certain topic, it doesn't mean you have to do the same. As someone who works for a fashion brand, I know for a fact how much brands appreciate it when you let them know you've featured them on your blog. Not only do they want to get as much feedback about their products and exposure as they can but its also very likely they'll want to retweet and share your post with their followers too. If they do, its a great way to get your post seen by new people and hopefully gain some new readers too - its win win situation for everyone! So next time you write a post featuring brands - don't forget to tweet them! I've never really been big on checking stats or analysing things too much as blogging is a hobby for me, not a job. However, I do like to check my stats page from time to time to see which posts have been the most read and have a nosy at the keywords that have led people to my blog. If lots of people have found it through searching 'mac lipstick review' for example or a post I've wrote has noticeably higher views, I know to write more on that topic. However, if you're serious about blogging as a career, you can also go one step further and analyse your traffic/audience/keywords and a whole host of other things via Google Analytics. Its very easy to set up and it will give you a great insight into what's working for you and what isn't so you can change things accordingly. I try not to get too caught up in the analytical side of things but like I said, if you're wanting to blog as a full time job or you feel something isn't working for you, its worth looking into! I can't even count the amount of blogs I've been unable to follow because there's no follow button anywhere on their sites or if there is one, its in a place where nobody can see it! It seems like such an obvious piece of advice but its SO important to place your 'follow me' buttons at the top of your site in a place where people will instantly see them when they click through to your blog. If its not easy to find, most people won't bother hunting for it and click off your site without following. The same applies for social media buttons - the best place to have them is at the very top of your site or in the sidebar beneath a welcome image/blurb. Make things easy for people and they'll thank you for it! I hope these tips were useful! Do you have any more? These were useful, I don't really look at my stats that much but I downloaded GA two days ago so will definitely keep an eye on key words! This is such a useful post, thank you so much for the tips! I think getting your name and blog 'out there' and to stand out is one of the trickiest things about blogging, but using photos and having an easy to follow button definitely helps! These are such great tips, I definitely love reading these posts! this was different to most advice pages, thank you! Thank you for this! I'm quite a new blogger and these tips will come in handy! This is all really great information, once again! Thanks! Thanks very good advice :) will definatley help me out a bit! Thanks, so helpful as usual ! Tweeting brands is so important, I always think they will never see the post otherwise. All the tips are great though! This was extremely helpful!! Thank you!! These are seriously great tips! I like those tips a lot..the last two I never thought of doing but I am nervous to tweet about them because no one really knows I blog yet! So tweeting it will have everyone know that I blog..hmm what should I do about that one? But that is a really really smart idea! Great post, thank you for sharing, I agree it is so frustrating when you cannot find a follow button on a gorgeous blog! This was genuinely such a useful post - normally these kinds of posts are a bit disappointing, but you actually gave some really good tips, many of which I haven't even considered before! Great tips! Have to agree with tweeting brands. As head of social media for my company I love it when we received feedback or a blog post. Always makes my day! Great tips! I haven't figured out how to do the follow buttons yet but plan to try in the near future. I could use some improvement on all of the other four. Even though I know my "stats" are good and I love my commenters I'd love to have more views, commenters and followers. You're so right about Tweeting brands. I've gotten lots of Retweets (including from @HerRoom) and some incredibly sweet comments (tweets) by doing that. @DollhouseBettie once Tweeted: "@Panty_Buns for President!" :D Your tips are excellent. Thank you for these blogging tips :) They are really helpful. I love this! These (and the first five) are all really great tips. I especially love the one about writing what you yourself would like to read, I think that's very important. Amazing tips that i will definitely be putting into practice. These are such great tips! You have such a lovely writing style :D.
Thanks for all the tips ! I just started my blog and I didn't realize how hard it is to get out there, even though I don't mind it would be cool to get feedback / comments haha, thanks !